Siyang Tian is the Ph.D. Candidate in Finance at Cass Business School. 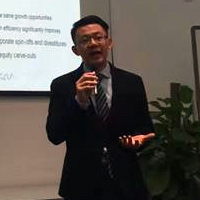 The focus of his research is empirical corporate finance, including private equity and venture capital, mergers and acquisitions, and corporate governance. His research papers were presented at FMA 2016, EFMA2016, and Nottingham Ningbo 2016 and will be presented at FMA 2017, Machester and Queen Mary. Also, he has been the research assistant in Cass Mergers and Acquisitions since 2015, working on both academic and consulting projects. Chinese (Cantonese), Chinese (Mandarin) and English. The focus of my research is empirical corporate finance, including private equity and venture capital, mergers and acquisitions, and corporate governance. FMA 2016. (Conference) Las Vegas, US Invited speaker. EFMA 2016. Basel, Switzerland Invited speaker. University of Nottingham Ningbo. (Seminar) Ningbo, China Invited speaker. Young Finance Scholars Conferencce. (Conference) Sussex, UK Invited speaker.